Apartment on Highvill is situated in Astana, 4.4 km from Bayterek Monument and 8 km from Expo 2017 Astana, in an area where hiking can be enjoyed. The Khazret Sultan Mosque is within less than 1 km of the apartment, and free WiFi is provided. The apartment is fitted with 1 bedroom, a flat-screen TV with cable channels and a fully equipped kitchen that provides guests with an oven, a microwave, a washing machine, a fridge and a stovetop. Palace of Independence is a 13-minute walk from the apartment. 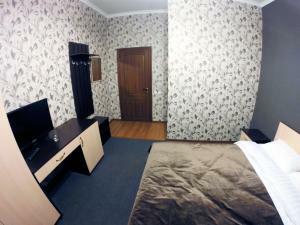 The nearest airport is Astana International Airport, 22 km from the property. When would you like to stay at Apartment on Highvill ? Each day we'll check prices and send you an email for your selected dates at Apartment on Highvill. If you don't have specific dates but would like to check prices for say next weekend or say next month we can check the price too. Click to write a review and share your experience of Apartment on Highvill with other travellers.